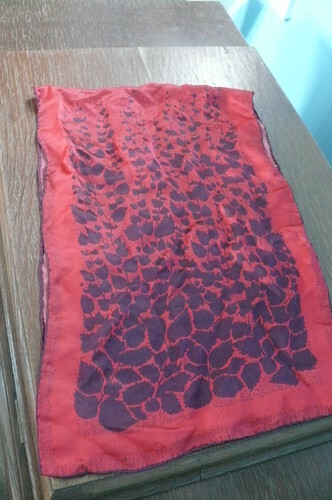 First off, I have three 60’s era silk scarves. I bought them from an online estate auction a while ago, and dude, I just don’t accessorize! I don’t know how and I just don’t do it, but I’m sure that someone out there can use or repurpose them creatively! Interestingly, these belonged to a fairly low-profile French actress– I can’t remember her name, but she was in one of Elvis’s lesser-known movies– and when she died in New Orleans, her fabulous wardrobe went up for sale. This is rectangular (it’s folded in half in the photo) and is 11″ x 34″ with print only on one side. 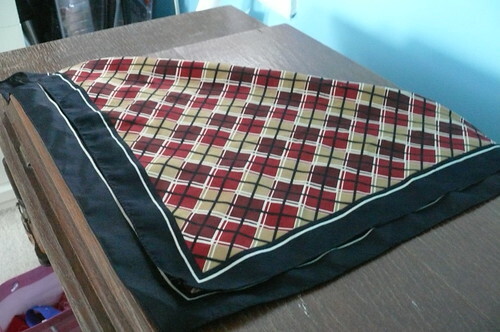 This guy is 20″ x 20″ and the plaid is printed on both sides. This one is 26″ x 26″, and the print is on both sides. 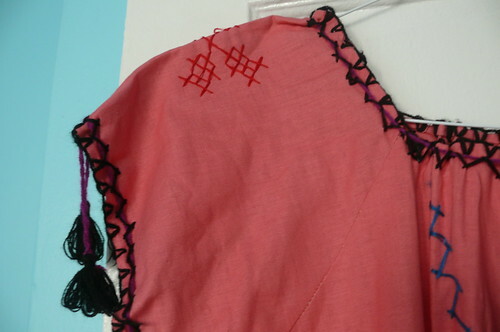 It’s kind of chiffon-y, and there’s a slight snag/hole that you can see towards the right. This dress is super cute, but doesn’t quite fit me right. It’s a wool blend, mostly red, with flecks of metallic gold running through the fabric. 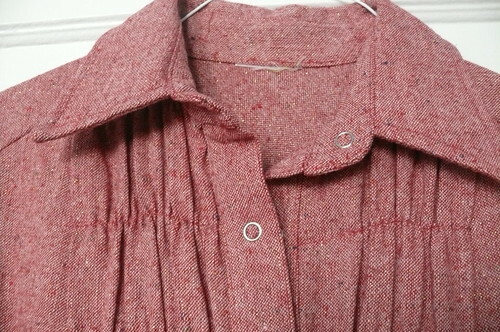 There’s a snap front and stretchy smocking on the front, and ties at the waist. Salmon pink! Donkeys! Cross stitch! This is a handmade (!) 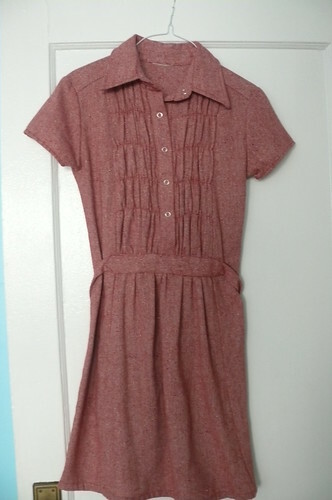 dress in a medium-weight cotton with a linen-y feel to it. 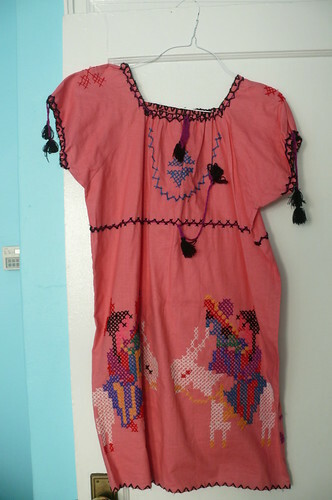 It’s embellished with cross stitch and embroidery. The color is so deep and pretty! I can’t imagine taking the time to add so much embellishment to a handmade dress! Do any of you guys do that? Andrea did a great job with her Skirt of Many Stitches this summer– check it out if you haven’t seen it yet! Not sure if anybody would like any of these goofy things, but if you would, leave a comment telling me what you like! If more than one person wants something, I’ll draw a winner at random. Let’s cut this off by Monday at 6PM EST so I can get these packed up and out of my apartment! Oh, and international shipping is fine! Oh, one last thing– does anybody use Singer class 66 bobbins? I have a 4-pack that I purchased when I first started sewing and didn’t realize that they weren’t the proper size for my machine. Let me know if you could use those, too! I guess I would prefer to ship those only to the U.S. since any further than that, the postage probably costs way more than the bobbins do! Black tassels on purple cords– awesome, no?? These items are so nice! And youn American girls are so generous, we do not have such a sewing community here in France! I really like your red scarf with purple flowers, I hope I am the only one ;). Thank you for your sweet blog ! I’d love that first scarf! Gorgeous! Isn’t cleaning things up and getting organized just awesome? (This coming form a control freak of course!). As it happens, scarves are my go to accessory and I really like the first one, so if no one else is interested please sign me up. Thanks for the give away! I feel sooooo much better (and I’m the opposite of a control freak– things usually just spiral out of control around me!)! I’m so excited to make a little headway with the massive unorganization ’round these parts! This is such a fantastic idea, Ginger! I love that wool dress – seems like I’m the only one! I also love the yellow scarf. 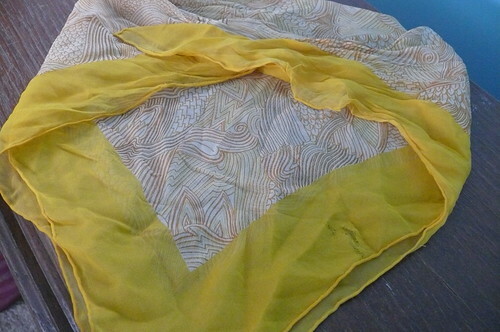 I collect vintage scarves, although I mostly collect Vera Neumann. And I do wear them regularly! I’m looking forward to seeing the “after” pictures of your sewing space. Happy cleaning! Seems like everyone wants the red scarf, and alas I’m in that camp too! I read your post, Ginger, and then promptly went into fantasy mode imagining myself as a french actress, with smoldering eyes & fantastic bangs wearing that red scarf. It’s matching my fantasy red heels, and blowing ever so in the light Autumnal Paris Breeze (my fantasies never take place in Winter)…. Heehee, I think all my knowledge of Rome is from Roman Holiday, too! If it’s half as fun as that movie, we’d have a blast there! I know exactly what you mean, wanting to make sure your vintage finds get to a place they’ll really be appreciated. 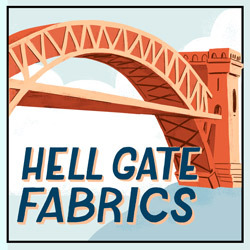 I did a giveaway for a vintage pattern recently (although the winner never claimed her prize, so I think I’m going to have to do it again) for the same reason. I didn’t want it, but I wanted its new owner to really love it. I’m far from being the only one here, but I would love that red and purple scarf too. I wear scarves all the time! Oh, I love the plaid scarf! As much as I don’t want to think about it winter is coming to NZ and it screams gorgeous to me! I keep thinking that I need to host a giveaway soon but my stash isn’t big enough yet! Very kind of you to offer these! Oh I would love the red scarf with purple design. I’m quite into scarves and that one’s a beaut! WOW. 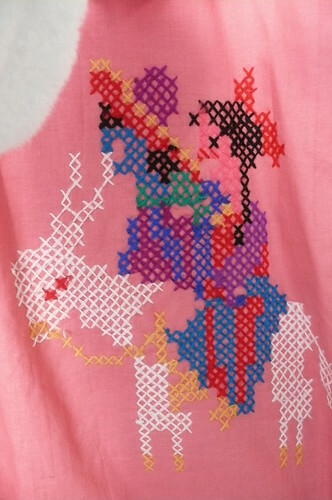 That cross stitch dress is out of control! I would love to win it! Okay, I would love the red wool shirtdress! I’m a sucker for a shirtdress and I’m amazed that this one is almost my measurements exactly. I can picture wearing your awesome yellow scarf with my white mod tunic dress! I’m also liking the purple leaves scarf. I’ve got my fingers crossed!